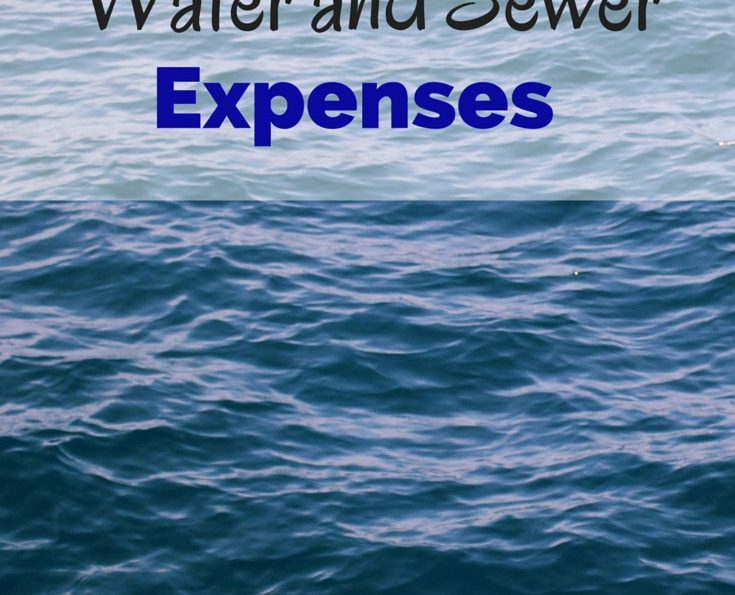 Sticking with our family budget, today I would like to review another expense that relates to owning a home – water and sewer expenses. For those homeowners that don’t get their water from a well, there is a good chance you are paying a monthly bill for water and sewer like my family. Our water bill is made up of two different services – water usage and sewer service. 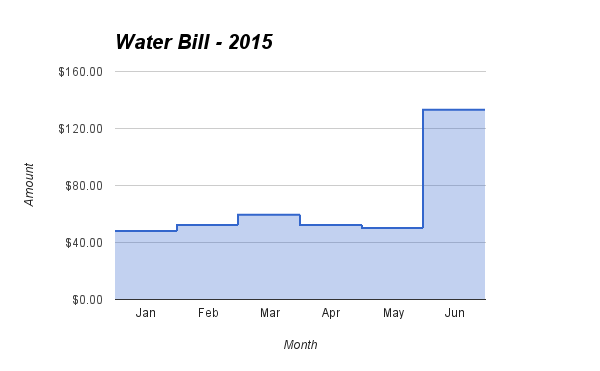 Both line items on our monthly bill are based on the water usage from the prior month. We have a water meter attached to the outside of our home that is used to track our monthly usage and then we are billed. This is one of those expenses that varies from month to month, depending on how much water our family of 5 uses. The bill is generally a bit higher during the summer months when we are watering plants and grass outside. We also have an in ground swimming pool that requires topping off from time to time. Looking at our bill from the past 6 months of this year, we generally pay between $50 and $60 a month. Yes, June is not a misprint. That is the first time we ever had a water bill over $100. Actually, it was the first time we had a water bill over $70! Why the big spike? Well, the swimming pool I mentioned earlier had an issue. Our water had a high concentration of acid in it, which required us to drain about 3′ of water from the pool and refill. Yep – we ended up having to fill the pool back up with a combination of rain and tap water. Note – Pools are very costly if you ever are thinking about getting one. My kids absolutely love it and we have had a lot of great memories with our pool. However, they are not cheap and can bust your budget quickly if you don’t plan ahead. As far as the new monthly budget we are working on, our plan is to set aside $60 per month for our water bill. I don’t expect to see our water bill spike again like it did in June. If it does, we will adjust accordingly. Considering we have a family of 5, we do a fairly good job of conserving as much water as possible. We never wash our cars (although maybe we should) and rarely water our grass. When it gets really hot, we do water our plants outside and need to top off the pool from time to time. In conversations with neighbors, I have found out that the majority of them have $100+ water and sewer bills each month. That makes me feel like we are doing something right and saving every last penny we can. Note – This is part of a series of posts where we are breaking down all of our expenses and building out a budget that will help us move towards financial independence. How much do you pay for water and sewer? Do you avoid things like washing your car and watering your grass to save on this expense?